London July 13 (IANS) The 5 300-year-old Otzi the Iceman s last meal was remarkably heavy on fat revealed the first in-depth analysis of the Iceman s stomach contents which also offer a rare glimpse of ancient dietary habits. 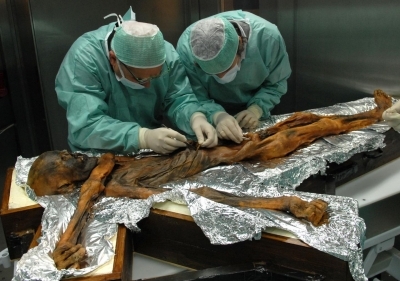 Otzi -- the oldest naturally preserved ice mummy -- was discovered by German tourists in the Eastern Italian Alps in 1991. The analysis reported in the journal Current Biology identified ibex adipose tissue as the most likely fat source. In fact about half of the stomach contents were composed of adipose fat. While the high-fat diet was unexpected the researchers say it "totally makes sense" given the extreme alpine environment in which the Iceman lived and where he was found. "The high and cold environment is particularly challenging for the human physiology and requires optimal nutrient supply to avoid rapid starvation and energy loss " said Albert Zink from the Eurac Research Institute for Mummy Studies in Bolzano Italy. "The Iceman seemed to have been fully aware that fat represents an excellent energy source " he added. "By using a complementary multi-omics approach combined with microscopy we reconstructed the Iceman s last meal showing that he has had a remarkably high proportion of fat in his diet supplemented with wild meat from ibex and red deer cereals from einkorn and with traces of toxic bracken (a genus of large ferns) " explained Frank Maixner from the varsity. The findings offer important insights into the nutritional habits of European individuals going back more than 5 000 years to the Copper Age. They also offer clues about how our ancient ancestors handled food preparation. Because of the mummification process Otzi s stomach had moved up and the scientists were unable to identify the Iceman s stomach. In 2009 his stomach was spotted during a re-investigation of CT scans and an effort to analyze its contents was launched. "The stomach material also contained large amounts of unique biomolecules such as lipids which opened new methodological opportunities to address questions about Otzi s diet " Maixner said. The analysis also revealed traces of the original gut bacterial community present in the Iceman s intestinal contents.